The Sirhowy Valley Walk is a good two-day walk from Tredegar House in Newport to the Nye Bevan stones near Tredegar. When I walked it there was no guide book but Caerphilly Council now publishes an on-line guide; notice also that it’s also been renamed the Sirhowy Valley Ridgeway Walk. I found the walk not too difficult to trace from 1:25000 maps apart from a forest section beyond Ynysddu station. For the most part it takes moorland on either side of the industrial Sirhowy valley – moorland punctuated by part-recovered spoil tips – with a central section around the town of Blackwood running closer to the river. Please not that the images on this page were taken with a freebie camera – it’s amazing the quality is as good as it is! 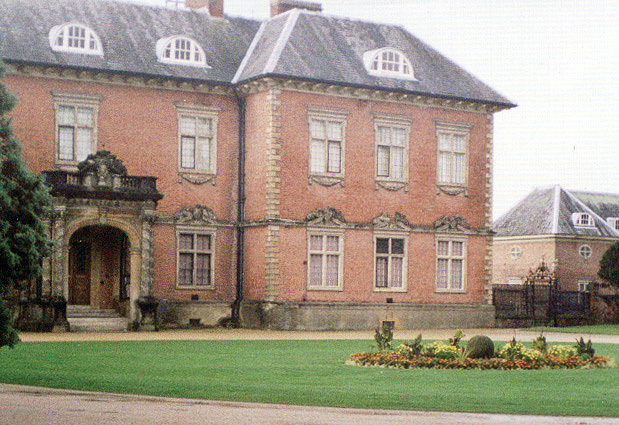 The Sirhowy Valley Walk begins at one of Newport’s most historic buildings, the Grade 1-listed Restoration mansion of Tredegar House. It was a grey and drizzly day however, and there seemed little to hang around for. The Walk then does its best to take in Newport’s leafier parts, including a pretty park, before ducking under the M4 to join a canal at the fourteen locks of the Cefn Flight on the Monmouthshire Canal, raising the canal 160ft. Industry follows, but Mynydd Machen is a good first hill. The outdoor centre at Ynys Hywel, with its warm and comfy cafe, was an unexpected bonus after drizzle on the moor. My day’s target was Blackwood, a town which still had a thriving Miners Welfare, though no thriving mines. This was Neil Kinnock country. Many may remember his “do not be old under a Tory government” speech from the Labour Club on learning of the party’s defeat from the jaws of victory in the 1987 general election. The river miles out of Blackwood are a beguiling mix of the rural and post-industrial, sometimes rising above the River Sirhowy, sometimes close beside it, including one stretch along a former rail line. I had looked forward to a lunchtime pint at Manmoel but alas the pub was shut at lunchtimes; but a first glimpse of the Brecon Beacons was something of a recompense. Some of the moorland here is a bit of a trudge in all honesty but views down to Ebbw Vale compensate. The finish, at the Nye Bevan memorial stones, is top notch; recall that in his heyday families trudged up to this barren spot to hear the great man orate of the socialist tomorrow – and he was one of the few who could claim to have delivered it, in the shape of the National Health Service. Alas I heard in 2013 of ‘continuous problems on this site, particularly in the nights when people congregate there’ – a telling comment on the state of the nation. Two great swathes of moorland, Merthyr Common and Mynydd Llangynidr, separate the Tredegar area from the Beacons proper. Neither sees many walkers as they are navigationally difficult, relatively flat with few paths. Proper walking then. My route took me along a former mineral railway to Trefil (another pub shut at lunchtimes!) and over Merthyr Common (a Hewitt, the first of the walk). From here I dropped down and around the western edge of the (disused) northern group of Trevil Quarries, then over Pant y Creigiau to the car park near what was once Torpantau station. My 1996 Harveys map showed the southern quarries as disused – in 2002, they most certainly were not – a rare lapse for this excellent mapmaker. Day four brought the first out-and-out mountain walk. Straight up to the Graig Fan Las escarpment, then cut across to Bwlch ar y Fan, picking up the top of Corn Du before Pen y Fan itself. I had planned Cribyn on the way, but the weather was foul enough not to bother. Descent was by Cefn Cwm Llwch, the most direct way to the lowland roads running in to Brecon itself. The New Foresters in Blackwood was an honest small town inn – glad I wasn’t staying there on the disco night though. The rest of the time my family came up and we stayed at the wonderful Penrhadw Farm in Pontsticill, just north of Merthyr Tydfil. This meant the luxury of lifts to and from starts and finishes; without them, Torpantau having been public transport-free since the rail line closed in the 1960s, I would have had to have plotted a different line.